For a printable brochure on “Water Safety,” Click HERE. 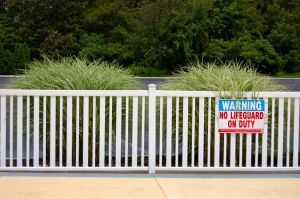 Supervision is the key word when it comes to pool safety, but supervision combined with a variety of barriers and safety devices – fences, latched gates, locked doors, pool covers and more – goes even further toward drowning prevention. Never leave a child unattended in the water or pool area for any reason. Don’t be distracted by doorbells, phone calls, chores or conversations. If you must leave the pool area, take the child with you, making sure the pool gate latches securely when it closes. Post rules such as “No running,” “No pushing,” “No dunking” and “Never swim alone.” Enforce the rules. Don’t rely on swimming lessons or “floaties” to protect your children in the water. Don’t have a false sense of security just because you think your pool area and home are secure. Always watch your children, whether in the house or outside.